Born December 9, 1999 in the hour of 12pm, this page tells the ongoing story of my neon, as well as providing a wealth of information about it in general. I find the car to be well built and a good value, although with any car, there are issues. 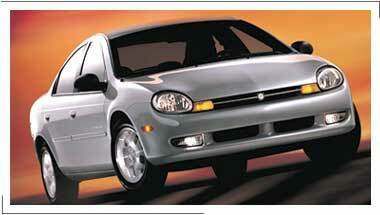 My neon is a 2000 Chrysler Neon LX fully loaded with all the features in bright silver. Actually it's a 2000.5 model as it has a few revisions over the original 2000s. I purchased it from Bob Roach at Winnipeg Dodge Jeep January 8, 2000 and took delivery January 18. December 9, 1999 My Car is Born and leaves the Belvidere, Illinois, USA plant around 12pm. January 18, 2000 My Car is delivered. February 9, 2000 Well the first few tanks of gas are running about 20mpg and 1000km was obtained as I pulled into the parking lot. March 13, 2000 Hit 2000km. September 7, 2000 All the way to 10000km, running around 26mpg now. October 25, 2000 Had the recall done in regards to the PCV valve, around 11500km now, mileage has slumped to 22-23mpg. December 17, 2000 Gas mileage dropped to a new low, 17mpg. January 3, 2001 Had the horn replaced due to failure. January 20, 2001 Disabled the automatic usage of A/C in defrost mode, it is now controlled manually, should improve gas mileage. February 17, 2001 Gas mileage hit a new low of 16mpg, the only driving on that tank of gas was the short trip to work and back, but still, it is rated at 30mpg city, 16 is bad. March 30, 2001 Surpassed the 15,000km mark, mileage has recovered to a more tolerable 20mpg with the warmer weather. August 7, 2001 Brought it in for the Brake Booster Hose recall, also had them look at the HVAC fan, of course it follows the cliche and it wasn't making any noise today, so it didn't get fixed. October 7, 2001 Surpassed the 20,000km mark. November 12, 2001 Installed an Interior Car Warmer. November 27, 2001 Service appointment for delayed transmission engagement, electronic lock failure, mechanical lock failure, and a badge that fell apart. They ordered the part for the transmission, replaced the badge, but couldn't reproduce the other two intermittent problems so nothing was done with them. December 3, 2001 Service appointment to install the transmission part to remedy the delayed engagement. January 29, 2004 The vehicle failed to cope with -40c weather. Battery was weakend and barely started the vehicle after a couple attempts. Electrical systems could be noticed resetting themselves. Tire couldn't maintain its seal and went flat. Rear center high mount stop light was punched back while trying to open the frozen trunk. Spare tire barely held air long enough to make it to the service center. Subsequently, lock system failed and locked me out of a running car in the cold. The next day the tire continued not to be able to hold air and required another remounting and sealing. June 2, 2004 Changed the spark plugs. Needs a 5/8" spark plug socket and two regular socket extenders. June 10, 2004 Surpassed 50,000 km fetching lunch.